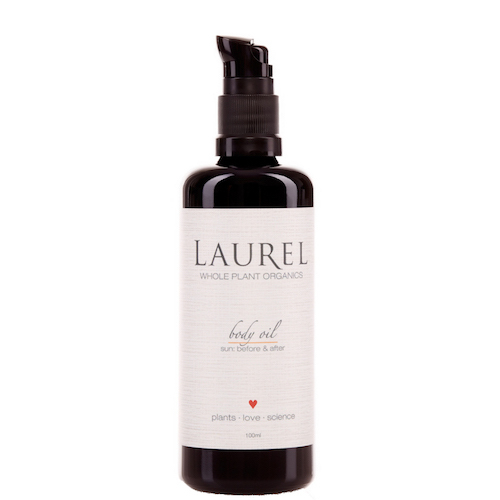 The Laurel Whole Plant Organics Before & After Sun Body Oil is an ideal moisturizer for all skin types. It features avocado, red raspberry seed and coconut oils for their luxe textures, rich vitamin and mineral content and are also known to hold natural sun protection qualities. The antioxidants of rosehip oil and sea buckthorn add a boost of vitamin C and E to ward off signs of premature aging caused by the sun. Organic and therapeutic grade essential oils of carrot seed, sandalwood, helichrysum, Roman chamomile, ylang ylang, neroli, and frankincense are chosen specifically for their ability to improve the appearance of sun damage. Combined, they have a bright and luscious scent. You are left with the feeling of summertime bliss thanks to Laurel’s housemade gem essence blend that lends a sense of light, truth, and joy. Massage the after sun moisturizer into skin as needed. For an added boost, apply after bathing while skin is still damp. All Laurel blends are amazingly fragrant, and exploding with plant power. If you're always in the sun, I definitely suggest investing in this Sun Supplement that will moisturize and complement any SPF routine. Your skin will thank you!